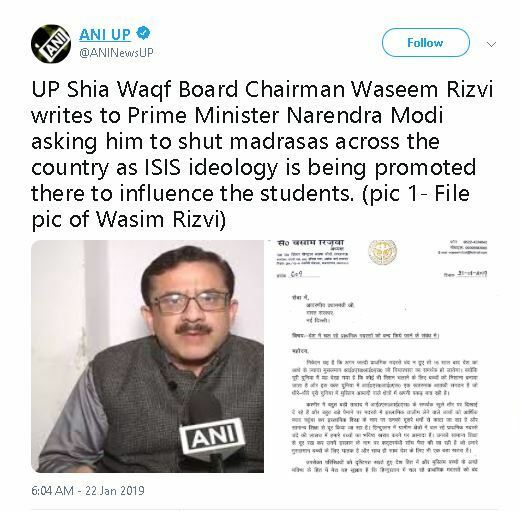 Shia Central Waqf Board urged to shut down madrasas in the country, alleging that education imparted in these Islamic schools encouraged students to join terrorist ranks. He demanded that madrasas be replaced by schools affiliated to the CBSE or the ICSE which will offer students an optional subject of Islamic education. The board alleged that the education imparted in the madrasas is not relevant to today’s environment and that it has been that the education of these institutions is encouraging the students to join terrorist ranks. He also claimed that the ISIS is enticing young children in J&K with money and in exchange, they are teaching them hostile doctrines in lieu of Islamic education. An Anti-Terrorism Court (ATC) in Rawalpindi reveals that students of Darul Uloom Haqqania, Akora Khattak, were involved in the murder of former prime minister Benazir Bhutto. Hate speeches form a regular part of these madrasas with an aim to entice religious violence. Pakistan Army Chief spoke of the transformation of Madrasas. If we recollect in December 2017, Chief of Army Staff, Pakistan, General Qamar Javed Bajwa had similar concerns. In a youth conference in Quetta, capital of the Baluchistan province he had said, “that madrasas are increasingly being used as a recruiting ground for terrorist groups in Pakistan”. He had said that madrasas had lost their function as a school for teaching religious principles, adding that We need to look (at) and revisit the concept of madrasas and give them a worldly education. I am not against madrasas, but we have lost the essence of madrassas, the Nation newspaper quoted the general stressing the need to revisit the religious school’s concept. Gen. Bipin Rawat too had spoken of revamping the education system of the state of Jammu & Kashmir in 2018. He had expressed concerns saying misguided youth come from schools where they are being radicalized. He has further said “What is being incorrectly informed to the youth of Kashmir is through the madrasas and the masjids. Some control has to be exercised on them and more “CBSE schools” should be opened. Last year 51 girls were rescued in raids conducted at a madrasa in Uttar Pradesh’s Shahadatganj after complaints of sexual harassment. They alleged that they were being exploited sexually inside madrasa kitchen and were even forced to dance to vulgar songs by the manager of the madrasa. In unsettling evidence (reported by India today) of what appears to be a covert infiltration of the ISIS ideology in the country, it is found that several madrasas in Kerala are teaching the theo-Fascist variety of Islam indoctrinating young minds to extremism. Madrasas have been part of the Islamic learning system and were usually part of mosques in early times. These mosques became social focal points for growing communities; they doubled up as schools for learning the Quran, basic instruction in Muslim ritual practices, and language instruction in Urdu, with accommodations for education and social needs. Madrasa curricula, in most cases, offers courses like “Koran-i-Hafiz” (memorization of the Quran), Alim (allowing students to become scholars on Islamic matters), Tafsir (Quranic interpretation), Sharia (Islamic law), Hadith (sayings and deeds of Prophet Muhammad), Mantic (logic), and Islamic history (mostly constructed, and invariably avoiding any discussion on weak points of old Muslim leaders). Look at the growing number of terrorist attacks, abductions, and bomb blasts all over the world. With the likes of Mohammad Sidique Khan, Shehzad Tanweer and Hasib Mir Hussain, (the three Pakistani nationals involved in London bombings) all mapped to madrasas, have opened a new chapter in international terrorism. In this whole affair what is strikingly tragic is that the Madrasas which are supposedly meant to impart religious teachings to young people for making them disciplined, tolerant and full of human values have degenerated into terrorist academies. The world is convinced that Madrasas are no less than Jihadi factories and it is near impossible to hoodwink the world opinion. It is a major challenge for the international community and has to be treated as such. While there are few madrasas in India initiating change to bring them in tune with modern times. However, reports suggest that the funds released under the Scheme for Quality Education in Madrasas (SQEM)and also under another scheme of Infrastructure Development in Minority Institutions (IDMI) have remained largely unutilized. “We offered them monetary assistance, but they refused,” said a state Education Department official when asked why the funds have not been utilized. Another source in the department said that there are more than 400 madrasas active in the state but only 58 of them are registered with the State Board of School Education.